My trip to Yellowknife was another amazing experience ! I headed up there to meet with Scott Smith- a friend of mine who is organizing a race called the Rock and Ice Ultra. I will be advising on the race- and this is very exciting for me because I get to do something I love to do- with good friends ! The race itself is going to be an extraordinary event. One of a kind., and truly a Northern Canadian experience. 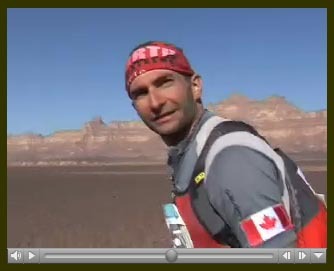 The premiere event will be the Diamond 300 (300 km stage race) through the “other desert” of the Northwest Territories. Vast, snowy and ‘scenic unique’, racers will get to witness Aurora Borealis (northern kights), rock and ice covered wilderness, among lots of other natural wonders of the North. As the name of the event indicates, first place winner will receive a $ 5000 Canadian Cut Diamond. You read that right ! More about the race and other stages/events in later posts. In NWT I gave a series of talks on my race expeiences (150 photos)- thankfully nobody was caught napping ! Just kidding. The talks all were well received and I was amazed at the participation of the Functional Running clinics I gave also. We covered Core Strength and it’s role in preventing injury, improving performance, and program construction. Aside from the talks I was able to train for Running The Sahara on some of the most beautiful trails I have ever been on. Yellowknife was such a cool place. A jewel in the Canadian wilderness of the north. So much seemed to be going on while I was there. The people were very athletic- and the 24 hours of more or less daylight helped to run around the clock !!! More tomorrow…I’m getting windy as usual. Gobi March -To The Finish ! The stages following the first two were no less gorgeous ! Lot’s of mountains and vast valleys- and good times for our team ! We laughed every day and I think I actually only had my MP3 blasting for 2 hours the whole race. The coolest part of the race for me had to be traversing these huge sand dunes that were encapsulated in a sand/wind storm. We topped out on this super huge dune and it was like being on top of some snowy mountain. The wind was whipping up sand and it was hard to see. We ran down the dune into a camp that was a community of ‘yurts’ or traditonal Mongolian huts. The camp was unable to erect the tents because of the high winds- so we got to spend the night in these awesome shelters. The stage itself had to be cut short- a relief when in a storm ! But for Kev, Charlie and I , the long stage is usually our time to fly ! Not to worry- there would be a second longish stage that had an incredible slot canyon section and river crossings. We tied the top solos for this stage win- and from here it would only be on more short stage to the finish. Hats off once again to RacingThePlanet for putting on such a unique event. We really had an awesome time- and once again got to see a part of the world and it’s peoples in a very unique way ! Thanks to GOJI JUICE for complementing my training completely. This stuff is amazing- it really is. Also, I would not have been so fortunate to have 3 wins in a row without Altipower to help prepare me for high altitude running. Injinji- no blisters in this race- AGAIN ! MAGO for keeping me burn free the first time ever, and CW-X. We all wore the gear and could not believe how many people are running in this stuff now.